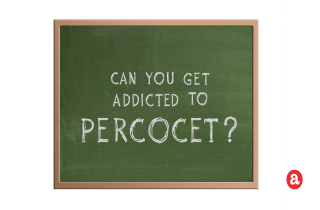 Eager to know how Percocet causes addiction? Read more in this article about Percocet’s addictive potential and ways to avoid it. Percocet addiction: A real risk or a myth? It is possible to get addicted to Percocet, even if you start taking it as prescribed. What makes Percocet addictive? The addictive potential of Percocet primarily comes from it’s main active ingredient – oxycodone. Oxycodone is known to have a powerful effect over a user’s brain and body. However, while some people are able to take Percocet therapeutically for years without developing addiction, others find Percocet use to be a slippery slope. In this article, we cover more about Percocet’s addictive potential. We’ll review who’s at risk of becoming addicted and go through the main signs of an addiction. Then, we offer tips to help you avoid developing a problem. At the end, we welcome you to join us for some Q&A. So, please post your questions in the comments section at the end. We try to respond to all real life questions with a personal response. Want to quit Percocet for good? You deserve a drug-free life! As Percocet (oxycodone and acetaminophen) enters the body, it acts on the brain and nervous system. In fact, when you take Percocet orally, oxycodone travels from the stomach lining to the bloodstream and then crosses the blood-brain barrier. There, oxycodone binds with opioid receptors in the brain. How does Percocet work for pain? Oxycodone’s main role is to change the nervous system’s of pain and stimulate the release of endorphins that mask sensations of pain.When you are injured, your body signals the central nervous system that something is wrong, and pain is felt naturally. As a pain reliever, Percocet blocks the sensations of pain by changing the way the brain perceives these sensations. Continue to use to feel good! This is addiction. In fact, as regular dosing of Percocet progresses, people who experience euphoric effect are on a risky path towards becoming addicted to Percocet. Physical dependence, tolerance, and withdrawal symptoms upon cessation. Continued use of Percocet despite the harm it causes. Craving or compulsive thinking about drug use. How does a Perk addiction happen? Percocet stopped working as effectively for pain: Initially, some people who are prescribed Percocet to alleviate pain experience that it becomes less effective over time. It is not uncommon for pain patients to start taking additional doses of Percocet when their therapeutic doses became ineffective in managing pain (tolerance). The higher the dosage gets, the more likely you are to become addicted with continued and longer term use. You are self-medicating: Some people seek out Percocet after they learn about its pain management properties or its intoxicating effects. The drug is commonly abused by those who want to escape from the sensation of pain or from struggles due to co-occurring mental health issues. You are after a recreational high: Percocet is mistakenly perceived to be safer than other opiates (such as hydrocodone or heroin), so many people opt for the high offered by this narcotic. The false image Percocet has for offering a “safe high” is the main reason it is commonly abused. You mix Percocet with other drugs and/or alcohol: People seek out Percocet because it can intensify the effects of other narcotics, benzodiazepines, and alcohol. People also combine it with stimulants such as cocaine or amphetamine. These reasons for Percocet abuse are just some of the most common routes to developing an addiction. What’s more, abusing this drug can lead to a serious overdose and end fatally. Having a parent with a history of addiction. Exposure to substance abuse at a young age. Mental health conditions, especially mood disorders such as chronic anxiety and depression. Psychological trauma, including loss of a loved one or chronic loneliness. Just as Percocet addiction has many causes – there are a variety of approaches that can successfully treat addiction in different individuals. Good addiction treatment programs are tailored to each patient, and there is something that works for everyone. Addiction is not your fault! It is a medical condition that responds to medical treatment. Take Percocet in larger amounts or longer than intended. Want to cut down or stop using Percocet but fail to succeed. Spend a lot of time obtaining, using, or recovering from the use of Percocet. Experience cravings and an uncontrollable need to use Percocet. Fail to perform normally at work, home, or at school due to Percocet use. Continue to use Percocet, even when it causes problems in relationships with family, friends, and partners. Use Percocet again and again, despite being aware of harmful risks and side effects. Need more Percocet to get the desired effect (tolerance). Experience withdrawal symptoms which can be relieved by taking more Percocet. Additionally, the DSM has a certain number of criteria that should be met for a doctor to diagnose addiction. The severity of any Percocet addiction is diagnosed based on the number of criteria observed. When you start using Percocet, you can expect to become physically dependent on Percocet. Dependence comes from a physiological need for the drug and is an expected and natural adaptation mechanism…it cannot be avoided! Do not increase your dosage without consulting with your doctor first. Be aware of the potential interactions with other substances (alcohol, antihistamines, anti-anxiety drugs such as benzodiazepines, and sleep aids). NEVER obtain your medication from sources other than a pharmacy. Be honest and tell your doctor about any other drugs you take such as over-the-counter medicines, prescription medications, or street drugs. Tell your doctor if you have a history of substance abuse, an addictive personality, or are experiencing any of the warning signs of addiction. 1. Practice self-care, remain active, and limit bedrest. First-line: Acetaminophen, and non-steroidal anti inflammatory drugs (NSAIDs). Second-line: Serotonin and norepinephrine reuptake inhibitors (SNRIs), or Tricyclic antidepressants (TCAs). NOTE: These are just some general guidelines. Your type of pain may not respond well or be helped by any of these suggestions. Please consult a doctor before you make any decisions for therapeutic or lifestyle changes in your pain management routine. Do you have additional questions regarding Percocet’s addictive potential and its signs of addiction? Please post your questions and comments in the designated section at the end of the page. We do our best to answer all legitimate inquiries personally and promptly.